The Saratoga is an ancient fish, from the Osteoglossidae (Bony Tongue) family, one of oldest on the planet. Having been around since the dinosaurs ruled the earth, they have not survived this long without being a cunning, top line predator in their Australian tropical freshwater habitat. Just look at that upturned jaw, those deep set eyes at the top of their head and that huge, bony mouth – you have a surface feeding predator if there ever was one. The Gulf Saratoga is a solitary fish and is very territorial and aggressive to other members of their species. Captured specimens often exhibit the scars of past battles. A carnivorous fish, the Saratoga mainly takes food from the water surface. The bulk of their diet comprises terrestrial insects, although they will take small fish, frogs, shrimps and yabbies. 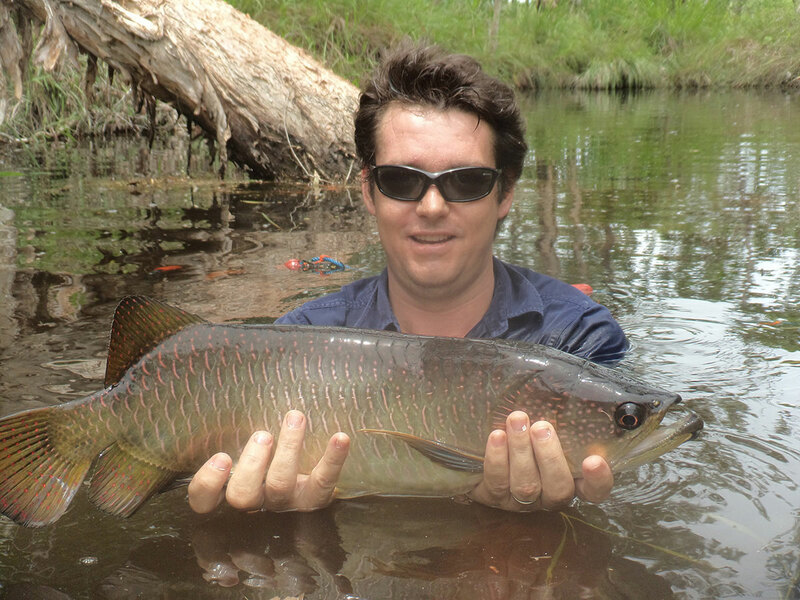 A well regarded angling species, Saratoga are spectacular jumping fighters and are the target icon species for freshwater fly fishers in Australias tropical north. These prehistoric fish trace their ancestry back to Gondwanaland and have relatives across Africa, South America and South-ease Asia, including the worlds largest freshwater fish the Arapaima from the Amazon. 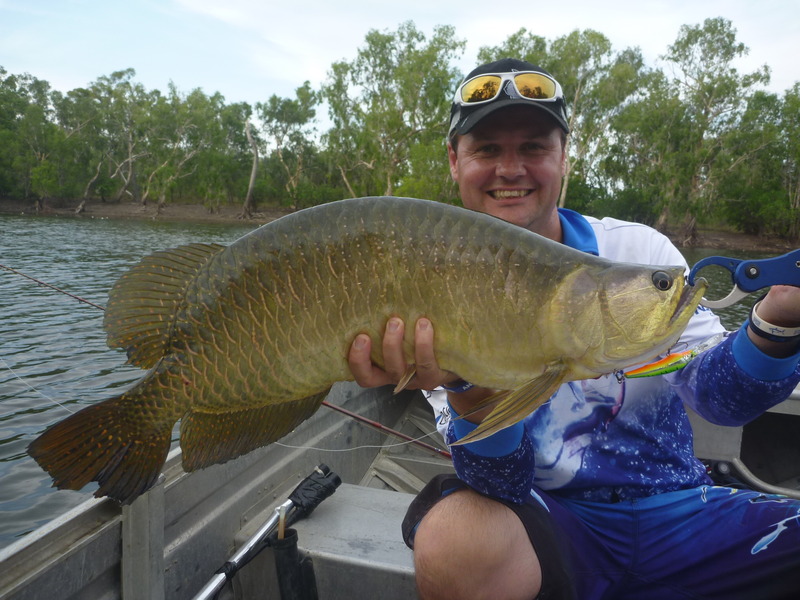 Australia has two species of Saratoga, one of which is confined to central and southern Queensland, while the other is found in the Top End, Kimberley and western flowing river systems of Cape York. A brood of juvenile Saratoga will often retreat into their mother’s mouth when startled. Saratoga are basically surface feeders BUT these fish eat BIG tropical insects and frogs. Light rods will not cast big wind resistant flies, so you will need an eight weight floating line to comfortably throw flies any distance. They have exceptional eyesight, consequently you need to be able to throw big flies a good 60 to 80 feet. Although usually considered poor table fare as they are bony, Saratoga are renowned for their willingness to take flies and their acrobatic fighting qualities are the stuff of legends. 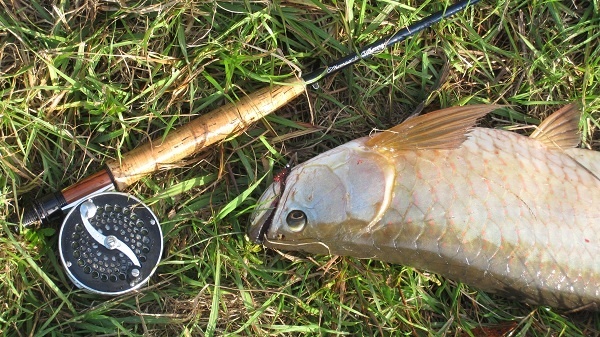 Their hard, bony mouths make hooking and landing them difficult. 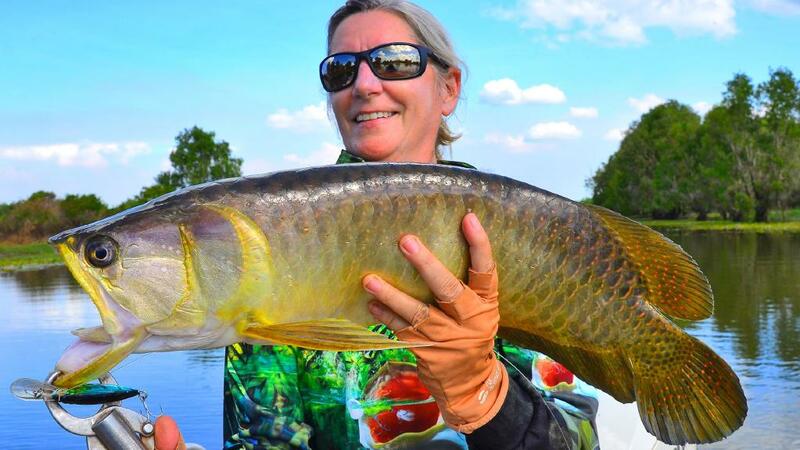 Sharp hooks are a must for these fish.